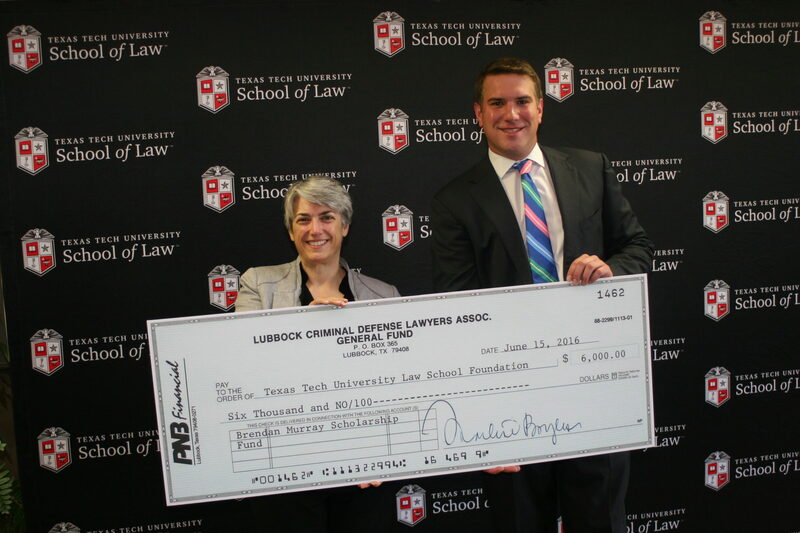 The Lubbock Criminal Defense Lawyers Association today donated $6,000 to the Texas Tech Law Foundation to benefit the Brendan Murray Criminal Defense Endowed Scholarship. Pictured from left are LCDLA director Allison Clayton, TTUSL Dean Darby Dickerson, LCDLA past-president Frank Sellers, and LCDLA president Taly Jacobs. In September 2006, Brendan Edward Murray, then a second-year law student, tragically passed away. 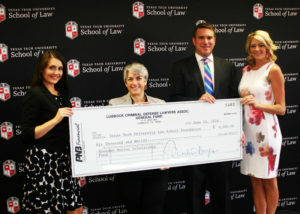 In his honor, friends established the “Brendan Murray Criminal Defense Endowed Scholarship.” This scholarship is awarded to students “who reflect certain ideals exhibited by Brendan Murray throughout his life: that the rights of the citizen accused are paramount in our system of law; that justice should be administered equally to all people, regardless of ethnicity, religion, or other arbitrary classification; and, that the role of the criminal defense attorney is to stand for those individuals and causes often condemned by society.” LCDLA’s donation was funded by the 2016 “Denim & Diamonds” event held in conjunction with the Prairie Dog Lawyers Advanced Criminal Law Seminar at TTUSL January 8-9.